Residing in the Day Block building built in 1883, Day Block Brewing Company tells the stories of their history through each craft beer. Whether it be Franks Red Ale paying a tribute to Frank’s Plumbing, which occupied the building for about forty years or their flagship IPA is named after Leonard Day himself - a local entrepreneur in which the building was named after. Their head brewer, Adam Weis uses his longtime expertise to bring the stories of the building and brewing process to life. "Each beer has a story behind it, you personally know & get to experience. Whether or not it was the perfect brew day, ultimate fermentation, ideal transfer conditions or maybe nothing seemed to go your way on that batch - it's all about the process. The best part of the job is getting to see people truly enjoy the beer you make; a smile on someone’s face after taking a sip is why I love my job." - Adam. 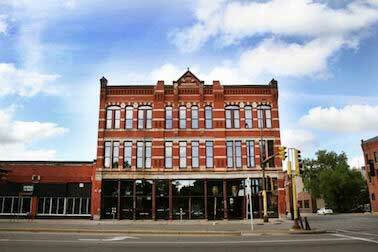 Day Block sits a few blocks from US Bank Stadium, located on the corner of 11th Ave S and Washington Ave. Hence why the Stadium Blonde beer is one of the top sellers. Adam tells the history of the building, the stories of the brewing process, and provides the true Day Block experience through each beer brewed. Day Block Brewing Company’s brewpub features two sides to belly up and grab a freshly brewed pint: the taproom and dining room. The taproom faces the brewhouse - displaying mountains of grain bags from local communities and tanks that are used to produce around 750 barrels annually. 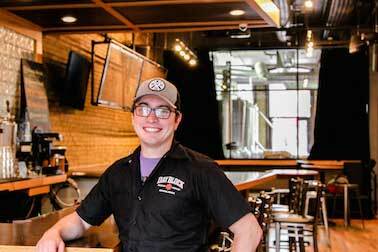 Being a brewery with food gives this brewpub the downtown Minneapolis restaurant experience many Minnesotans & visitors look for. 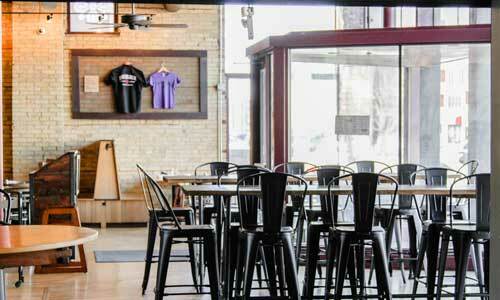 "Brewing at Day Block has been one of the most fun experiences of my life. Not only does this place feel like a home it has a family aspect to it. We run together as a team. Instead of the Kitchen, Brewery, and Front of House being separate, we work together to make the best food, beer, and service we possibly can," Adam says. Day Block Brewery has been the foundation for Adam's brewing and provided him with the control to make his mark on the city. Here's a little bit about what makes Adam the brewer that he is today. "I started home brewing as soon as I could afford my first kit. I went from malt extract to all grain after two brews. Luckily enough, my girlfriend's parents at the time (now my wife), had a big house with a kitchen on the top floor. I quickly turned this into my little brewery. I went on to graduate from the University of Minnesota and didn’t really want to go into what I got my degree in. I visited Siebel Institute of Technology and fell in love with the program. The program was six months long in Chicago and Germany. My lovely wife really pushed me to become a better brewer; she told me “You have to do this, you have to do what you love.” Boom. I was off to Siebel then later to Doemans." "I learned how to brew beer by all the classic homebrew books in the beginning, and making plenty of mistakes in the early years. Going to Siebel and Doemens was amazing, I learned so much from those two schools. 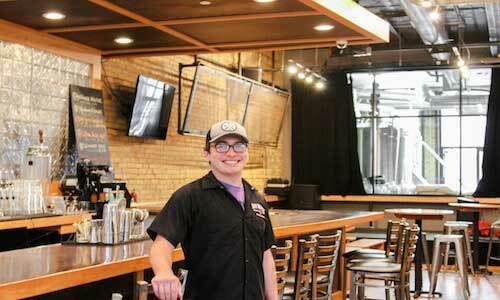 After school, I got a job at Lift Bridge Brewing Company. I started out driving the truck and doing deliveries for about a year, then worked my way from the bottom up. Four years after that I was the Cellar Manager and filling in where ever they needed. It really taught me that if you wanted something you had to go out and get it, nothing was going to get handed to you." 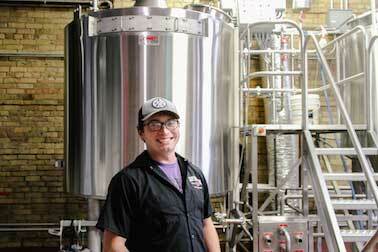 " I have always wanted to work in a brewpub ever since I started brewing. I first started my career off in a production brewery where I learned everything. After 5 years, it was time for a change and I was lucky enough Day Block was looking for another brewer. I had an interview with Jeff and Chris Hahn and here I am. To go from brewing recipes that weren’t yours to brewing a recipe you’ve worked really hard at and see it bloom into a beer that you personally love to drink has been amazing. I’m very thankful for the freedom of creativity here at Day Block." " I love brewing on our small batch system, it makes about a keg of beer at a time. It really gives me an opportunity to play with ingredients I've never used before. It also gives our cooks a chance to make something off the menu to pair with the beer we developed."